JOHN DELANEY’S TENURE as chief executive of the Football Association of Ireland has come to an end, with the 51-year-old stepping down from his position on Saturday night to take up a new role as Executive Vice-President. In a lengthy statement released shortly after Ireland’s 1-0 victory against Gibraltar, the FAI confirmed that a recent review of its senior management has resulted in a reshuffle. It sees Delaney’s 14-year term as CEO end with immediate effect as he takes up a newly-created role which includes responsibility for “all Fifa and Uefa matters” and “all FAI tournament bidding projects” among other duties. Chief Operating Officer Rea Walshe has been appointed to the role of Interim CEO by the FAI Board as the recruitment process begins for a new CEO. “Jonathan Hall Associates was engaged to review senior management structures and the role of CEO as the Association plans for the launch of a new strategic report for the period 2020-2024 and ahead of its centenary in 2021,” the FAI statement read. At a meeting on Friday, the board of the FAI unanimously adopted the review and unanimously voted to appoint Delaney to his new role. Neither Delaney, as Executive Vice-President, nor the new CEO will be members of the FAI board, although both will attend meetings of the board. The responsibilities of the new Executive Vice-President include all Fifa and Uefa matters including membership of the Uefa Executive Committee, all FAI tournament bidding projects, international relations and support, the John Giles Foundation, membership of the Board of the Aviva Stadium, planning for the centenary of the FAI and the 50th anniversary of women’s football in Ireland in 2023 and a bid to host the UEFA Women’s Champions League final in Dublin,” the statement explained. The FAI hope to confirm the Association’s new CEO at its AGM in July. Delaney came under significant pressure this past week after revelations of a €100,000 loan provided to the FAI two years ago came to light. The Sunday Times last week revealed that Delaney had provided a loan to the FAI due to a cashflow issue arising within the association. He said that the money was repaid in full in June 2017, and that it was the only occasion on which he issued the Association with a loan. Delaney further addressed the loan in a second statement published by the FAI last Sunday, in which he said he acted in the FAI’s best interests. “I acted in the best interests of the Association at a time when immediate funding was needed,” Delaney said. Email “John Delaney steps down as chief executive to take up new FAI position”. 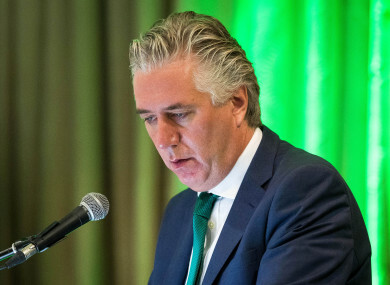 Feedback on “John Delaney steps down as chief executive to take up new FAI position”.